What do you do when there is a rain delay during Game 7 of the World Series? You bake cookies of course. Okay, maybe this isn’t what everyones first instinct is, but it definitely was mine last night. I actually came across this recipe when I was in college and then remembered it because it appeared in one of my facebook memories from more than 5 years ago. Made me think it was time to bring this one back for fall. This recipe is SO easy it hardly constitutes baking. I honestly could make these with my 4 year old nephew as long as I operated the oven. I totally get they they use a little help from the grocery store (cake mix! ), but sometimes that is just nice to have! 2. Sift spice cake mix so there are no lumps. Add in pumpkin and combine. This will be sticky!! 3. Form pumpkin into tablespoon size cookies and place on a sprayed baking sheet. These will stick to your hands, so spray them with a little cooking spray to help get them round. 4. Bake for 10 minutes. While the cookies are in the oven, unwrap the hershey’s kisses so they are ready to go. 5. 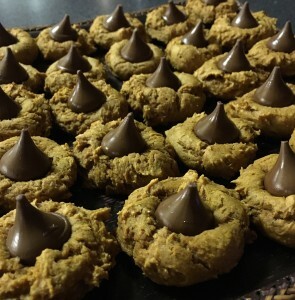 Immediately out of the oven, push one kiss into the center of every cookie. Allow to cool and eat!